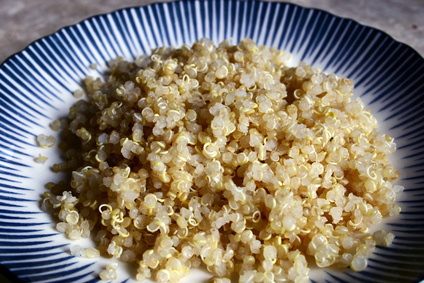 Packed with protein and calcium, quinoa is quick and easy to prepare. Because it retains its shape after cooking, it is a good gluten-free substitute for bulgur in tabouleh and other marinated salads. It can also be used in place of rice or pasta in many dishes. Quinoa has a bitter coating, so always be sure to rinse it well before cooking. For the best results, you should cook the quinoa ahead of time and cool it before making the salad. This prevents the grains from becoming gummy. To prepare the quinoa* rinse it well in a mesh strainer. Boil the water and the salt in a saucepan and then add the quinoa while stirring. Reduce the heat to a simmer, cover the pot and allow the grain to cook for 15-20 minutes, until all of the water is absorbed. Cool the grain and then mix in all of the other ingredients. The salad tastes best if it is prepared at least 2 hours before serving so that the flavors can marry. This dish works well as a main course or a side dish. It is even better the next day and makes a great portable lunch. Variation: Smoked salmon provides both protein and salt in this recipe. For vegetarians or vegans you can substitute 1 cup of cooked black lentils and ½ cup of crumbled feta cheese (cow, goat or sheep), or ¼ cup of chopped salt cured olives. * For an energy saving method for cooking quinoa, soak the grain for 8-12 hours in enough water to cover. Before cooking, rinse and drain it well. Because it has absorbed some of the soaking water, you will only need to boil 1½ cups of cooking water. Add the grain to the boiling water, simmer it covered for 5 minutes and then turn off the heat. Keep it covered and allow it to sit for 10 more minutes before cooling. Presoaking grains and seeds also makes them easier to digest. I would love to give credit to the original creator of this recipe, but it has been circulating around health food and macrobiotic circles for as long as I can remember. That is not surprising, it’s free of dairy, eggs and sugar, and still delicious. There are so many variations that it can be made to suit almost everyone’s diet. The version below is gluten-free. Grind the nuts in a food processor or coffee grinder. A coarse grind will give you a nutty, crunchy cookie; a fine grind will yield a more delicate dough. Mix the nuts with the flour, cinnamon and salt. Add the oil and maple syrup and stir until the dough is well mixed. If the dough is still dry and crumbly, add ¼ cup of water. Take @ ¼ cup of dough, shape it into a ball and then press it into a thick disk shape. Place it on a cookie sheet and press your thumb into the center of the disk, making an indentation. 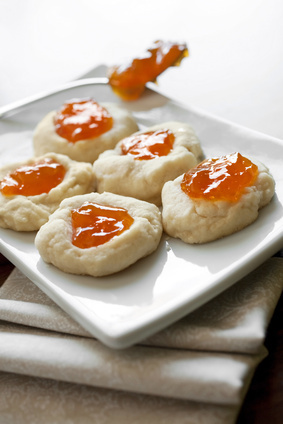 Repeat this with the rest of the dough and then fill each thumbprint with jam. Bake the cookies in a 350 degree F oven for 20 – 25 minutes until the edges are brown and the jam has bubbled. Cool them for at least 10 minutes before serving. Variations: This recipe is so versatile. It can be made with any flour combination, any nuts or seeds, any liquid sweetener and any oil. For example you could use all rice flour, shredded coconut, butter and honey. For a less sweet cookie, substitute juice for the sweetener and fruit puree for the jam. It also makes a great pre-baked pie crust. Just press the dough into a pie pan, bake it for 30 minutes and cool it before adding a no-cook filling like fresh fruit and whipped cream. Experiment and enjoy!